If like many female fans of the Pirates of the Caribbean films you are wanting to recreate a beautiful nautical look similar to Elizabeth Swann's then look no further, this is the Ladies pirate fanc dress costume for you! Included is a stunning white shirt styled with authentic looking jagged sleeves, a dark brown suede look waistcoat decorated with fabulous tie up detailing, a red coloured waist sash and a black skirt decorated with a blue and black diagonally striped fabric overlay. Completing the costume is the all staple accessory for any budding pirate, a red headband. 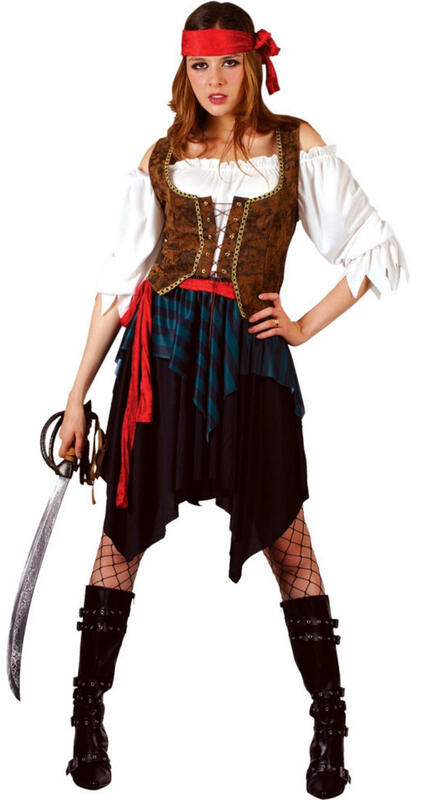 Perfect for any pirate themed fancy dress party and sure to have you looking like the sassiest sailor there.